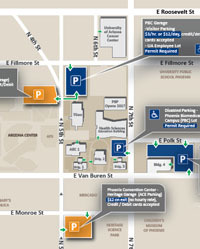 The Phoenix Biomedical Campus and the UA College of Medicine – Phoenix are located on 7th Street between E. Filmore Street and E. Van Buren Street. From the east: take Interstate 10 (west) to the 7th Street exit, turn left (south), go one mile to 7th Street and Fillmore Street. From the south: take Interstate 10 (west), to Interstate 17 (north), to the 7th Street exit, turn right (north), go two miles to 7th Street and Fillmore Street. From the north: take Interstate 17 (south), transfer to Interstate 10 (east), exit at 7th Street, turn right (north), go one mile to 7th Street and Fillmore Street. From the west: take Interstate 10 (east) to 7th Street exit, turn right (south), go one mile to 7th Street and Fillmore Street. From Phoenix Sky Harbor Airport: Follow the signs for the West Exit (24th St./Downtown). These signs will take you to the Interstate 10 West (I-10 West). Proceed to the 7th Street exit, turn left (south), go one mile to 7th Street and Fillmore Street. Click the image for large PBC campus map (PDF).